International Business Travel and Etiquette Tips | Mentor Works Ltd.
International business travel requires significant research and planning. One of the most critical factors to consider is the culture of the countries(s) you are entering. Each country has a unique culture, and understanding proper international business etiquette not only improves the first impression you make; it will also makes the trip a more enjoyable and successful experience overall. When travelling abroad for business, you are not only representing yourself, but your department, your company, and your country. Having taken two “gap years” before starting my career, I’ve been fortunate enough to have visited over 15 countries and to have lived in Europe for almost two years. I’ve experienced the importance of knowing the basic customs and cultures of your host country and can confidently say that this knowledge made travelling much easier. The same principles that helped me can also benefit your upcoming international business trip. So take the time to understand the customs and cultures of countries you are travelling to. As result, you’ll have more success with your international business contacts. Etiquette means taking into consideration the rights and feelings of others and being respectful to individuals with different backgrounds and cultures than your own. Demonstrating cultural knowledge, interacting effectively, and adapting to cultural differences are valuable skills for business leaders. It’s not necessary to become fluent in the native language of the country you are travelling to, but knowing some of the basic phrases will help. It not only makes understanding your surroundings easier and saves you time, but it also allows you to immerse yourself more into the culture of the country you are in. Being able to say something as simple as “thank you” to your client in their native tongue shows initiative and allows for a more meaningful interaction. Related blog: How to Make your Next Business Trip Stress-Free. Communicating to your customer in their own language opens the door to a more genuine connection and ultimately impresses your business contact. While most business professionals may be able to speak English, you should not assume everyone is comfortable using it. If there is no common language, hiring an interpreter might be an optimal solution. Thankfully, learning the basics of a new language is now easier than ever. There are dozens of well-known, reliable mobile applications available to learn basic phrases. Most apps provide an interactive user learning experience to make the process fun and easy to tie in to your busy schedule. Popular language learning apps include: Duolingo, Babbel, Busuu, and Memrise. In a world where first impressions and appearance are everything, it’s critical to know how to dress for success during international business travel. Doing business abroad requires respect, so presenting yourself in an appropriate manner is essential. Take the time to review itinerary and plan your outfits accordingly. If possible, it is wise to ask your contact or host of the country you are travelling to for suggestions of what clothes to bring. Consider all situations you might encounter while abroad, such as first-time meetings, casual events, cocktail parties, or black-tie gatherings. To learn more about individual countries and their dress codes, Kwintessential offers an excellent free guide of business etiquette tips. Pay attention to foreign countries that have strict standards for attire. Destinations such as the Middle East generally require women to be fully covered and dress in a conservative fashion. In certain Asian countries you may be required to sit on the floor, so wearing looser fitting clothing is a good option. Men are generally acceptable when wearing a dark suit and tie, but depending on the climate of your destination, be prepared to wear one in hot weather. Paying attention to details while packing simplifies the potential complexities for international business travel and prepares you for any event. As your first impression, introductions play a significant role in the success of your international business travel. Researching how to properly introduce yourself in the country you are travelling to goes a long way and helps you foster mutual respect and professionalism. Pay attention to the way people communicate; are they loud and more outgoing or is there a soft-spoken and patient approach? Become familiar with prefixes, titles, and hierarchies to introduce yourself and others. Make sure to speak in a clear voice while introducing yourself. This makes it easier for your contact to remember your name and adds value to the first impression. Different cultures around the world also have unique body language during introductions. While a handshake is often appropriate, in Japan a simple bow might work just fine. The French frequently kiss on the cheek, but Finnish people are cautious about their personal space and tend to be more reserved. Eye contact in North America is commonly shown as a sign of respect and indicates that you are paying attention to who you are talking with, while in Latin America strong eye contact could be deemed as rude or aggressive. Strong communication skills foster a good working relationship between you and your international contact. Gift Giving: Each country will have different views on gift giving. While some clients may be thankful for the gift, others may interpret it as a form of bribery. Before purchasing a gift, consider who it is directly going to, what types of gifts are acceptable in that country, and if available, the company’s policies on gift giving. Dining/Alcohol: If possible, find out which restaurants you will be eating at to choose an outfit accordingly. Practice basic table manners and take your time eating to focus on the conversation at the table. Typically, it is best to avoid alcohol unless the host partakes or there is already a friendly business relationship established. Religion: Religion guides and shapes human behaviour, so be mindful and take into consideration the commonly-held religious beliefs of the country you are travelling to. Before scheduling meetings, check for national holidays and see how that holiday is typically celebrated. Educate yourself on topics/words to avoid during conversation to ensure you do not offend your client’s religious beliefs. Punctuality: Depending on the specific country’s punctuality standards, there may be different versions of being “on time.” Your best bet is arriving 5-10 minutes before the scheduled meeting time, as some people may feel rushed if you arrive any earlier. Pay attention to countries that place high value on punctuality such as Germany and Switzerland. Business Card Handling: To abide to a professional standard, keep your business cards in a card holder to keep them crisp and clean. As well, find out if a specific country requires the cards to have multiple languages on them. Meeting Mannerisms: Educate yourself and avoid topics that might offend your client. Make sure to respect a person’s personal space and pay attention to how close you are standing to them. As always, have your cell phone turned off, and if it is crucial to make a call during the presentation, inform those in the meeting prior to it starting. Global expansion projects require significant time and resources. Fortunately, there are many tools and free guides available online to help business leaders better understand the process. Mentor Works has gathered over 100 of these resources and consolidated them into our Canadian Business Guide to Export Expansion. Access this resource to learn more about market research, competitive research, and nailing your interactions abroad. 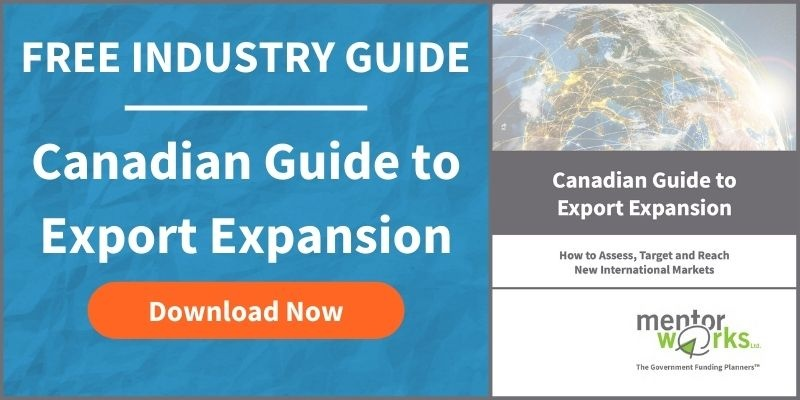 Download the Canadian Business Guide to Export Expansion white paper. Posted: May 2, 2018 by Myra Bredin. Updated: May 2, 2018 by Myra Bredin.